Had you asked me just two years ago if I’d ever run, let alone run a race, I’d probably had cocked my head slightly, looked at you, and laughed. It’s just not something I’d ever though I could do. My only real experience with sports has been playing defensive positions, because they don’t generally require a lot of distance running. I don’t remember ever making it beyond 1 lap around a football field. 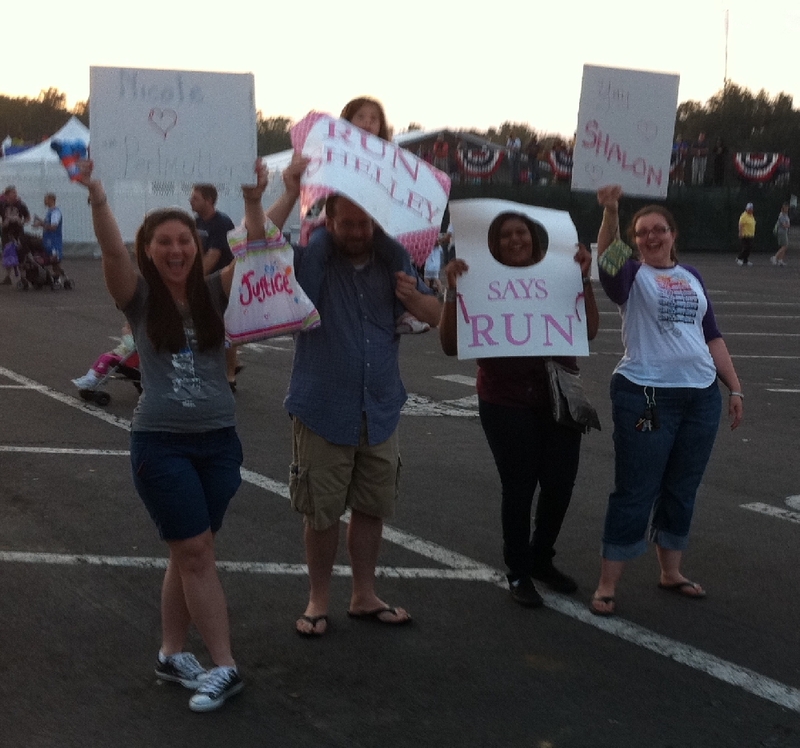 But as I’ve mentioned before, a morning spent cheering for friends at the 2010 Walt Disney World Half Marathon changed all of that – I had become inspired. Well now, after close to a year training myself to be a runner and loosing more than 75 pounds along the way (and counting! 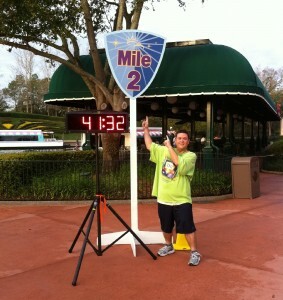 ), I can finally say that I’ve met my first goal of running a Disney Race. No it wasn’t a Half Marathon, it was the Beauty and the Beast Royal Family 5K. My plan was to experience this race, time wasn’t a concern, nor was the distance – I already run 5K or more several days a week at this point. 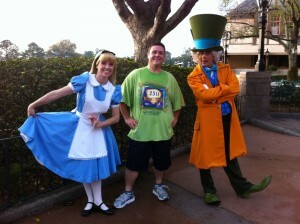 Rather, I was fixated on the meet and greets that would be offered along the race route. I got this in my head after hearing stories from my cool “cousins” Jackie and Lindsay about all the fun they had running the Half Marathon back in January. 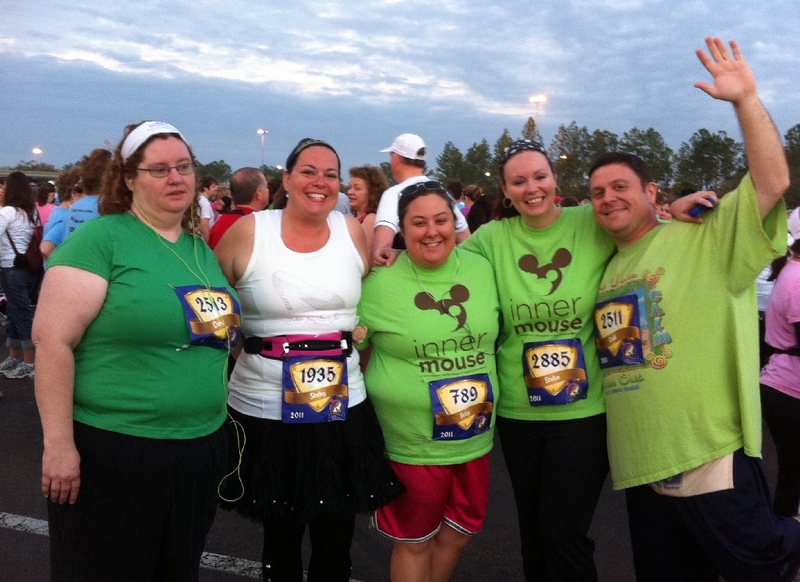 I had also decided that I would run this race with friends as I’m a firm believer that being with friends can plus just about any Disney experience. However, my biggest surprise came from my wife, Cheryl when she decided to register for the race as well. As she’s not a runner I was a little concerned, but she does go to “boot camp” several times per week – we were both just hoping she wouldn’t be swept. 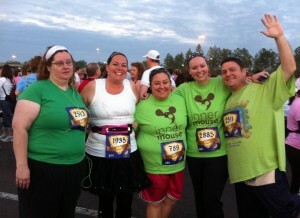 The morning of the race we met with our friends Shelley, Betsy, and Shalon at Epcot in the Imagine parking lot. Betsy, having run her first Disney race a few months, was our veteran while Shalon, Shelley, Cheryl, and I were all running our first Disney race. 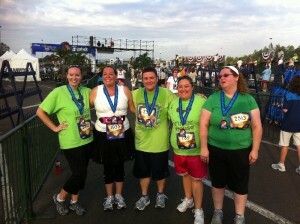 It was requested that we be at the race by 6:15am and the race did not start until 7am. 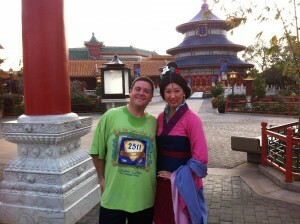 This allowed us some time to hang out together and watch the sun rise over Epcot. As we went to line up in the corral we had chose as our starting point – the one just ahead of the walkers – we discovered that it was quite full. So much so that, after the fireworks that started the race, we had to sort of merge into the mass of racers. I was really expecting to just run, but what I found instead was that for the first bit of the race it was elbow to elbow. And it was nice to see friends like Nicole, Dave (Shelley’s husband), Dana, and Christa cheering us on. We all walked relatively close to each other for a bit, I kept Cheryl in my sight because I wanted to make sure she was completely comfortable before I raced ahead. While waiting for the crowd to thin out we talked and took some photos. And then finally, after we came around the the Wonder Parking lot we were able to get enough space to start running. I checked with Cheryl that she was okay, gave her a kiss and headed off. From there we entered a junkyard area where I got to see old Jungle Cruise ships and old Studio Backlot Tour trams I got to pose with some members of the Public Works. 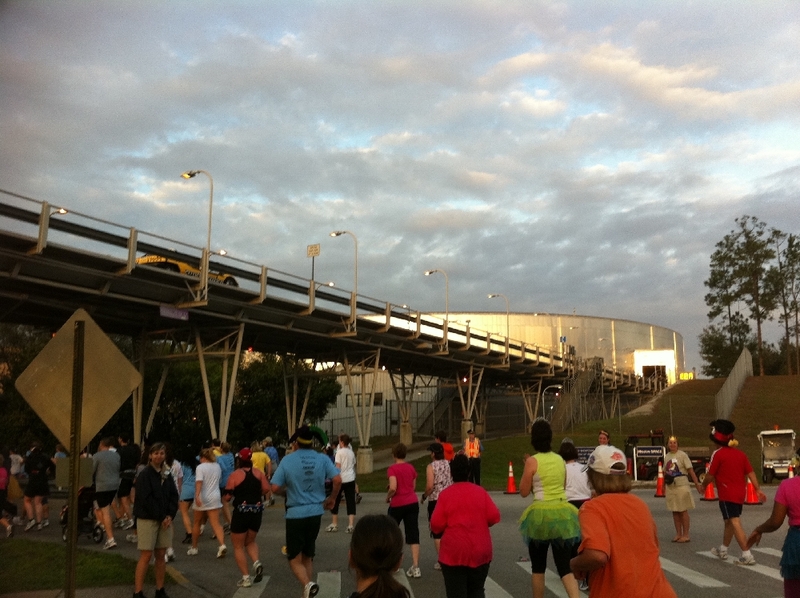 We then got to run behind the scenes and underneath the outdoor portions of Test Track where they had cars going very slowly overhead. 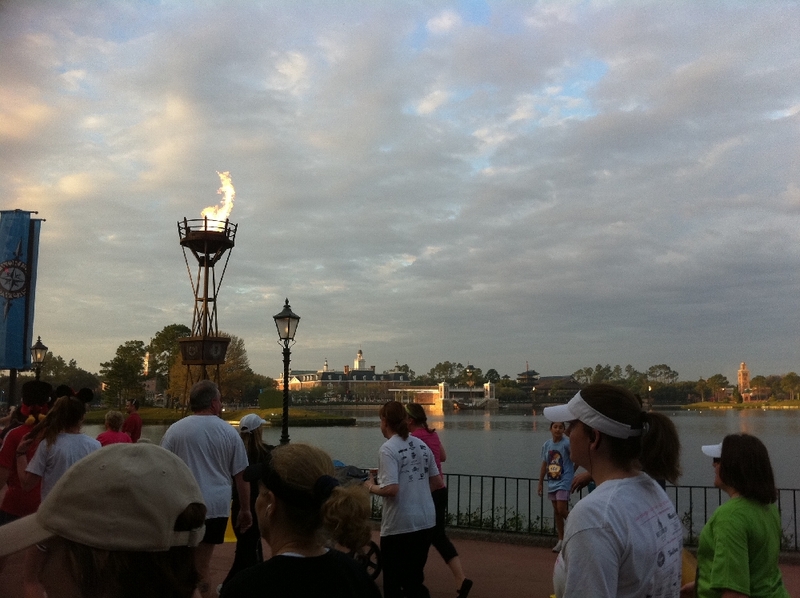 Running past, they had us enter in between Mexico and Norway and we were greeted with lit torches around World Showcase. At this point it was all about the meet and greets, and my first stop was with Mulan in China. Her line was very short – normally when she’s out in the pavilion she doesn’t attract much of a line. To me the Hall of Prayer is one of the prettiest buildings in World Showcase, so I love this shot. 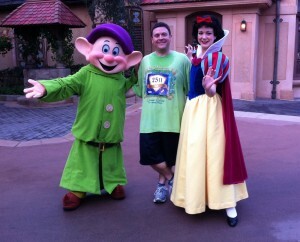 From there I got to meet up with some pink cowgirls while waiting in line to see Snow White. By comparison I waited close to 15 minutes in this line. This allowed everyone else to pass me, which worked out well as I was able to use them to pace myself after that point. And after bumping into my friend Lori and other members of the WDW Radio Running Team, I was able to catch up with Cheryl and Betsy before stopping to pose with Pocahontas at the American Adventure Pavilion. The next two characters were Aladdin in Morocco and Cinderella in France, but the lines were far too long to wait for so I skipped them. We then headed briefly out of the park through the International Gateway and around the back of the United Kingdom pavilion, where I got to have some water with Cheryl. Entering back into World Showcase, I had to no choice but to stop for a final meet & greet with Alice and the Mad Hatter so I could pose for my friend JL who loves Alice in Wonderland. 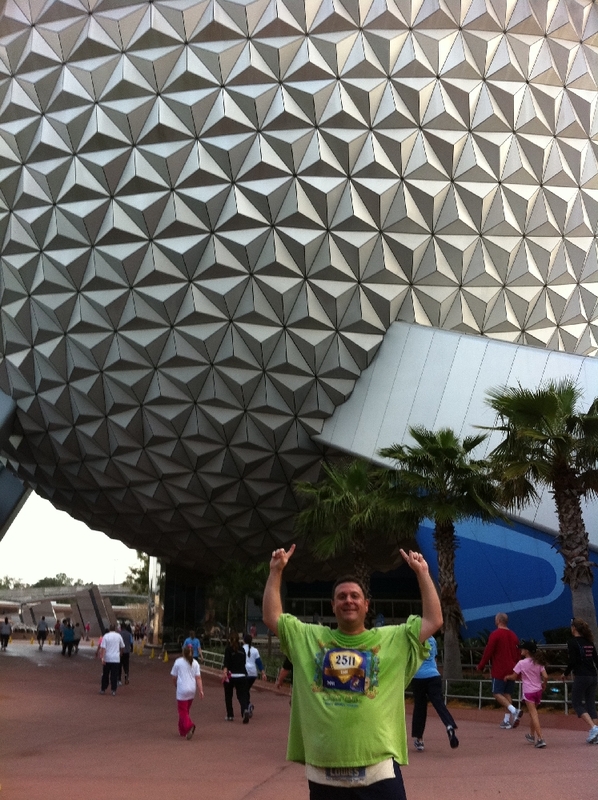 After once again passing Lori and her group I posed in front of Spaceship Earth and then caught up with Cheryl and Betsy near the Epcot turnstiles staying with them a short bit nefore I ran ahead. I caught up with Shelley and Shalon near mile marker 3 where we all posed, and then we headed to the finish line. I got across first and managed to take pictures of everyone else as they came across. Overall, the race was a lot of fun. I really enjoyed getting to do the meet & greets, and seeing some behind the scenes stuff. I’m very proud of my wife Cheryl who did amazing and was nowhere near being swept. 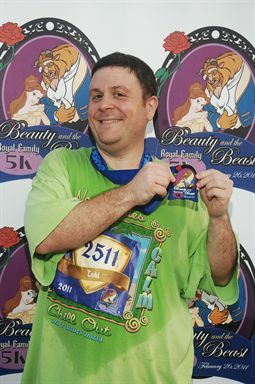 This race has me really psyched to for my next race, which will also be a bit more than just running as Shalon and I team up to tackle the Expedition Everest Challenge at Disney’s Animal Kingdom in May. What about you? 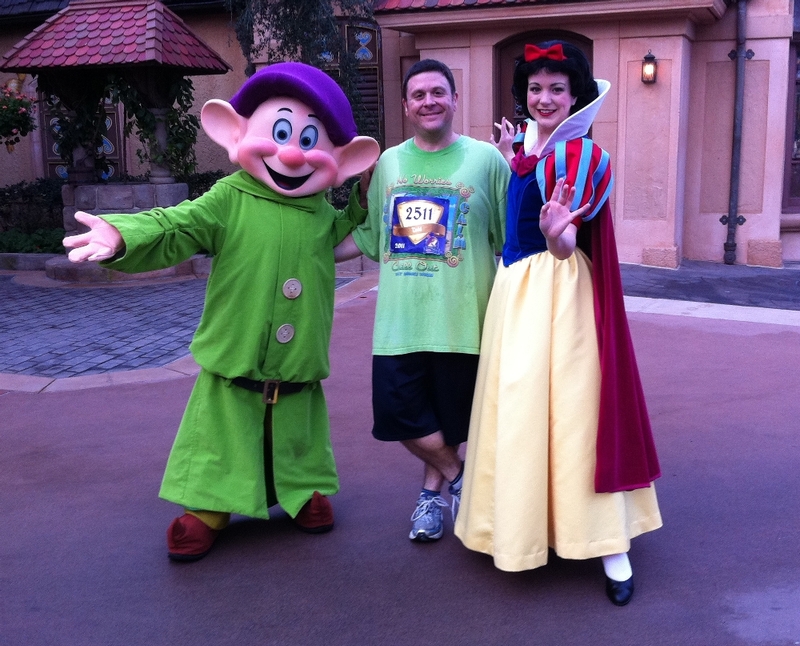 Have you run a Disney race or Marathon? Are you inspired to participate in one? Are you looking to become a runner? Do you need encouragement? Keep moving forward. 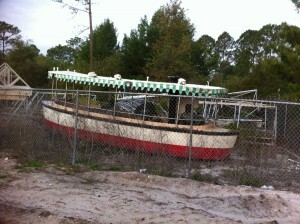 Return of Epcot’s Research Center? May 27, 2009 Recent News Comments Off on Return of Epcot’s Research Center? Good for you! i loved all the photos, you look so happy! I hope you keep moving forward and do many ore races. You are settng a wonderful example! Great job! Thanks Amanda! There were a lot more photos I would have loved to have posted. I went into it planning to have fun, and I really did. Glad it showed. I hope to inspire others. As I told you before, I am so proud of you and Cheryl for completing this. As much as you have told me that I am an inspiration, I am just as inspired by the two of you. Thanks Megan. You’re still like Wonder Woman compared to us when it comes to this stuff. Congratulations to you and Cheryl!!!! Now I’m inspired. I have C25K on my iPhone and have begun the journey! Yay Janet! Let me know if you have any questions. 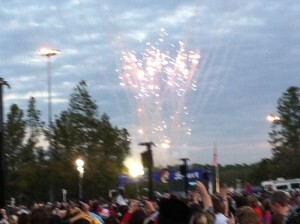 Great job Todd & Cheryl! I realy think I’m going to register for the 5K Wine & Dine in October! You made it sound like such fun! Very cool Dennis. Hope to see you then. Cool! Congratulations! I am thinking of maybe trying to get it together to do the Oct 1, 40th Anniversary 5K… but I don’t think it is even going into any parks… Reasoning similar to yours- the experiences along the way, but also want one of them nifty medallions!